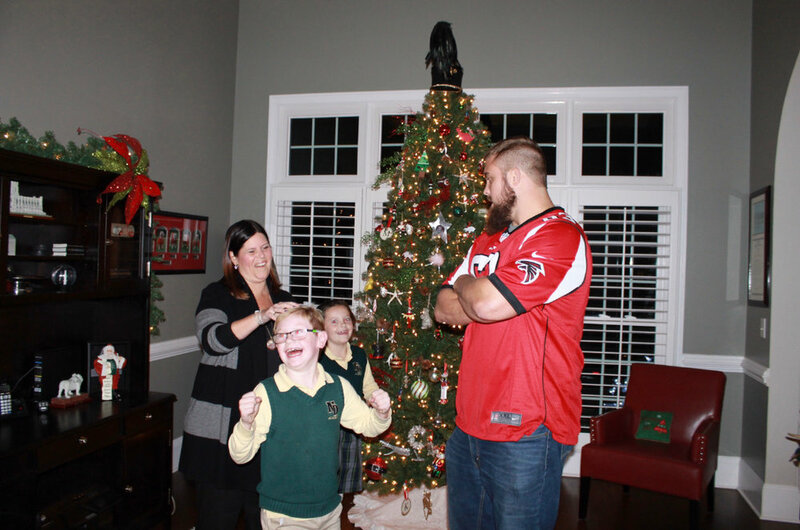 Falcons guard/center/defensive tackle/renaissance man Ben Garland is a perennial fan favorite. Staring down his 31st birthday in April and headed for free agency, we might’ve seen Ben play his last snap as a Falcon. That doesn’t detract from his legacy one bit, especially when he’s still out in the community doing good work with a Falcons jersey on his back. She hosts an annual memorial golf outing, dinner, and silent auction to benefit Children of Fallen Patriots Foundation (Fallen Patriots). The non-profit’s mission is to provide college scholarships and educational counseling to military children who have lost a parent in the line of duty. Through the generous support of participants and donors, Kami has raised more than $140,000 which will help pay for 22.4 years of college. So Garland found out about Kami and showed up at her door with Super Bowl tickets. Here’s the video. A warning: if you don’t have a tissue box nearby, go find one, because you’re going to need it. If you’ve been following this team since 2015, then you’re intimately familiar with Garland’s good works. He went to the Air Force academy and is a captain in the Colorado Air National Guard. I’ll be ecstatic if the Falcons can find a role for him going forward. If not, he’ll be a Falcons alum we check in on frequently.